Export your overall email performance data or recipient data for a specific email. 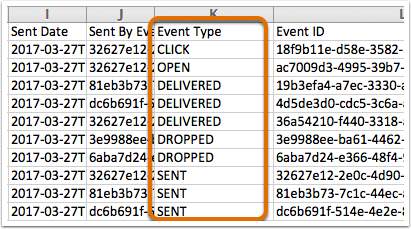 Learn how to analyze the basic or advanced email data from a specific sent email. In the upper right, click download Export emails. In the dialog box, click the File format dropdown menu and select the file format for the download. Under Export type, select All emails or Emails sent within a custom date range. For a more detailed report, select the Include advanced report data checkbox. Click Export. You will receive an email with a download link to the export file. Click the name of the email. In the left sidebar menu, navigate to an email status to export recipients from. In the upper right, click the List actions dropdown menu and select Export recipients list. Choose the Basic or Advanced export. If you select the Advanced option, use the dropdown menu to select the email events to export. 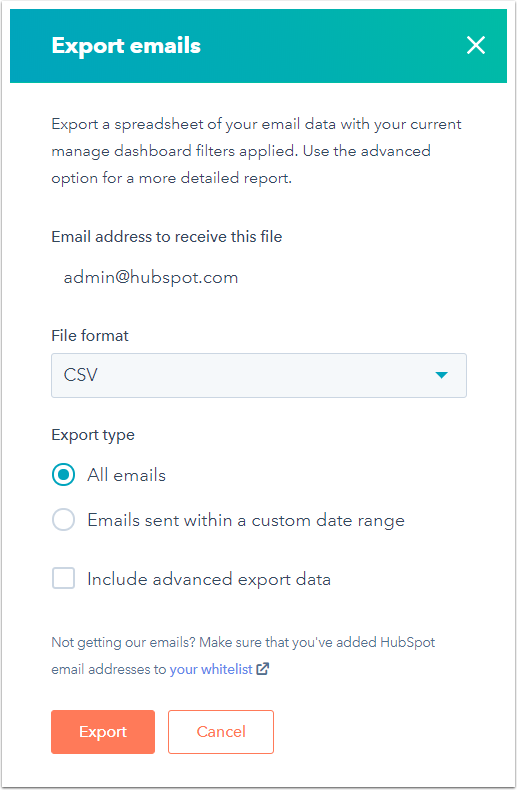 Click Export to receive a CSV file of the email recipient event data in your inbox. A basic export includes basic information for each recipient. You can see columns with TRUE or FALSE values to learn more about each recipient. If you sent an A/B email test, you can see which version your contacts received in the SubType column. 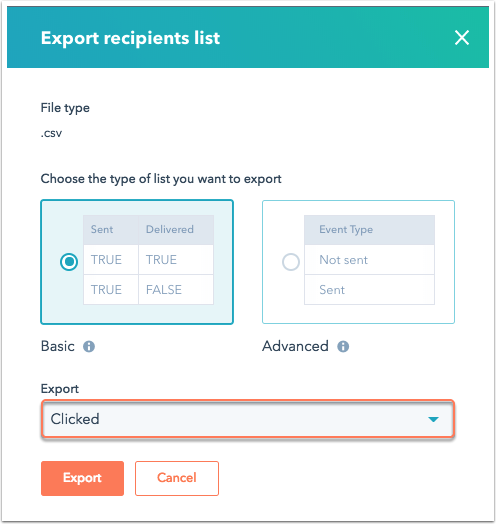 An advanced export provides more details about each recipient, including responses for messages that are marked as processed or deferred. You can also see if any updates were made to your contacts' eligibility to receive email. Here's a list of the terms in the Event Type column in an advanced export. Each recipient may have multiple events listed. Sent: the email was sent to and received by our delivery provider, and has queued it for further processing. Processed: the email was received by our delivery provider, and it will attempt to deliver the email to the recipient's email server. Deferred: The recipient’s email server has temporarily rejected message, and subsequent attempts will be made to deliver the email. This is also referred to as a soft bounce. Delivered: the recipient's email server has accepted the email, and it's been successfully delivered to the recipient. Open: the recipient opened the email. Click: the recipient clicked a link within the email. Bounce: the recipient's mail server had a delivery problem sending the email to the recipient. Dropped: the recipient previously hard bounced or unsubscribed, making them ineligible for this email send. Suppressed: the recipient was excluded from the message due to low engagement using the Don't send to unengaged contacts feature. SpamReport: the recipient flagged the email as spam, or moved it from their inbox into their junk folder. Unsubscribed: the recipient unsubscribed from one or more email subscription types. Unbounce: the recipient was either automatically or manually unbounced. An unbounce resets the bounce status of the recipient. StatusChange: the recipient changed their email subscriptions in some way. MTA_Dropped: our delivery provider decided to drop the email. This typically indicates the recipient's address is invalid. Forward: the recipient forwarded the email. Print: the recipient printed the email.